For half a century, John R. Hamilton distinguished himself as one of the greatest and most influential photographers in the entertainment industry. From the 1940s to the 1990s, he was celebrated for his portraits of actors like Steve McQueen, Paul Newman, Elizabeth Taylor, Brigitte Bardot, Ann-Margret and more. His Life magazine cover from 1965 is one of the most iconic photos ever taken of John Wayne. 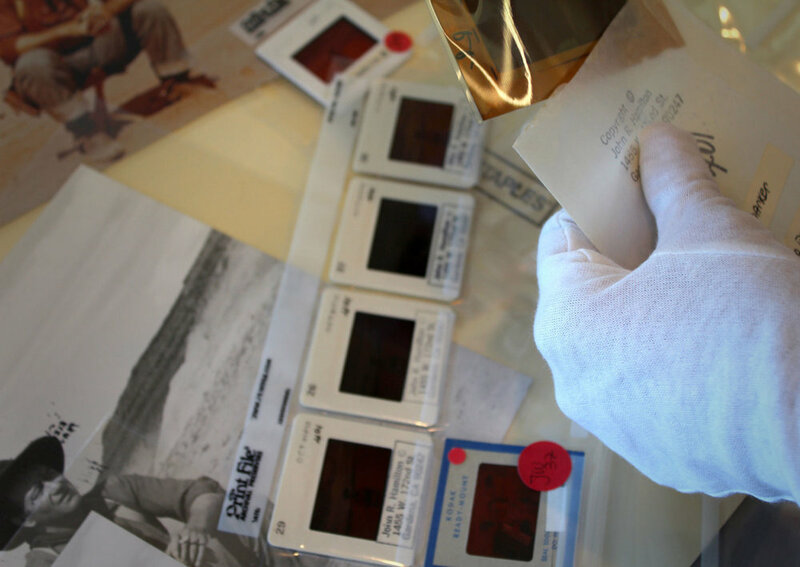 In 2014, John Wayne Enterprises had the unique opportunity to acquire a portion of the John R. Hamilton Collection that features John Wayne. The John R. Hamilton / John Wayne Collection contains black and white negatives, color slides and silver gelatin photographer prints of both previously published as well as never before seen photos from the sets of John Wayne films such as The Searchers, The Horse Soldiers, The Man Who Shot Liberty Valance, The Sons of Katie Elder, Hellfighters, and El Dorado. Unfortunately, film deteriorates. And as stewards to this historic collection, it is our mission to preserve it using the most effective modern archival methods. Because Hamilton lived and worked in the era before digital photography, it was necessary for him to duplicate slides on a Reponar slide copy machine in order to submit his images to the magazines. This posed a challenge to us as we need to find the earliest generation to be used as a source image for digitization and restoration. 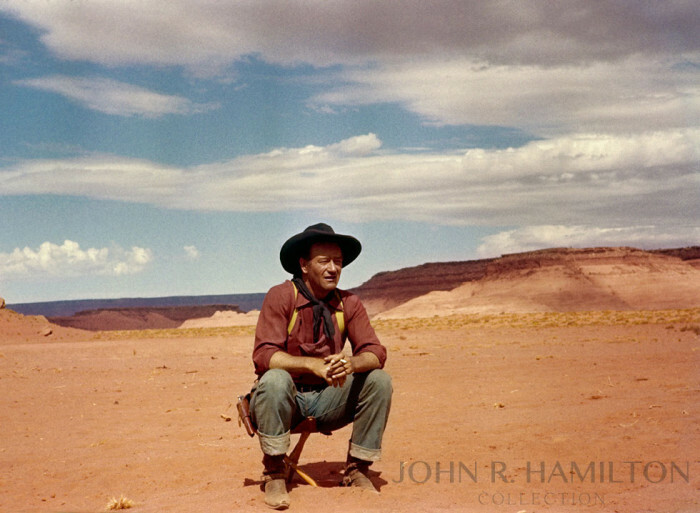 Here, we are looking at the grouping of color transparencies of one of the earliest John Wayne images in the collection: John Wayne sitting on a stool in Monument Valley, AZ during the filming of The Searchers in 1956. Being nearly 60 years old, the restoration work required careful cleaning before being scanned raw (ie: without any corrections). Once scanned, the image was then matched to the photographers’ prints and corrected for color balance, saturation, tone, and spotted to remove any remaining dirt. The end result of that process is an image that has been preserved for future generations and is part of the John R. Hamilton / John Wayne Collection Limited Edition Fine Art prints.